Most of the time I am a weekend warrior style backpacker, although I like to get out on longer trips a few times a year. California has such variety in scenery and terrain that I am never lacking in a place to visit, and most weekends find me off in the mountains exploring new (to me) trails and peaks. I follow lightweight, but not ultralight, backpacking techniques, but am known to carry a few luxury items from time to time. In addition to traditional backpacking I enjoy snowshoeing, skiing, and snowcamping, as well as long dayhikes, geocaching, and peak climbing. These activities are enough to keep me busy year-round in the great state of California. Below is the Skin200 Crew and the Bodyfit260. The next four months will find me splitting my outdoors time between the Silicon Valley, the Sierra Nevada and Cascades, and the Northern California coast. Outside of the mountains, this is the rainy season and daytime temperatures range from the 50s to the 60s F (10-18 C). In the Sierra and Cascades, winter will soon be here and stormy winter conditions are the norm. Sunny and warm days on the snow are also not unusual though - it is one of the reasons I love visiting the snow so much! Icebreaker breaks their clothing down into three categories: Skin Layer, Mid Layer, and Outer Layer. The Skin layer is the soft, breathable, next to skin layer, whereas the other two layers provide varying additional layers of warmth. Each layer is broken down into tops and bottoms of various styles. This report series is for two items from the Skin Layer. These items are the Skin 200 Lightweight Merino Underwear Oasis Crewe and the Bodyfit 260 Tech Top. This top is 100% pure merino, and based on my experiences with wool I never would have guessed it. The shirt is packaged in a box that provides all kinds of useful information about the advantages of wool, presumably compared to the synthetic competitors: no stink, breathes better, warms better, and feels better. I often have my doubts about the 'feels better' claim. I usually find wool to be itchier and less durable than synthetics, but one touch of this top changed my mind. It is incredibly soft - softer than any tops I have, both synthetic or wool, other than a fresh new fleece. Only time (and testing) will tell how durable it is. 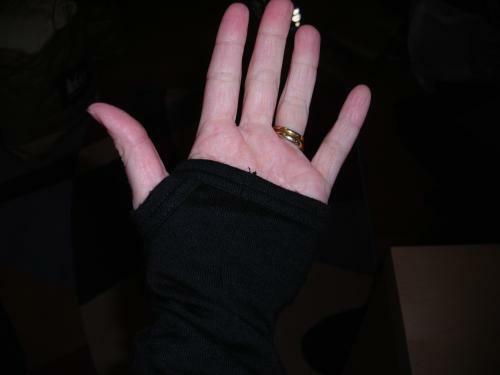 The top is a typical crew shape - long sleeved, regular neck, and no pockets or zippers. This size small shirt fits snugly, even tightly, next to my skin but doesn't feel too small. According to how the shirt fits on the model on the website, I expected it to be a tight fit. The size guide on the Icebreaker website only provided a bust and height measurement as a guideline, and I fall right on the size Small measurement for the bust (35 in). The arms are a little bit long, and the shirt extends below the waist. I like shirts that fit this way - the extra length in the arms and torso keep them from rising up on me when carrying a pack. As a next to skin layer, the material is light weight and thin. I have experienced 100% wool tops of this weight wearing through at the hips and shoulders, so I am curious to see if this holds up to my regular use and abuse! 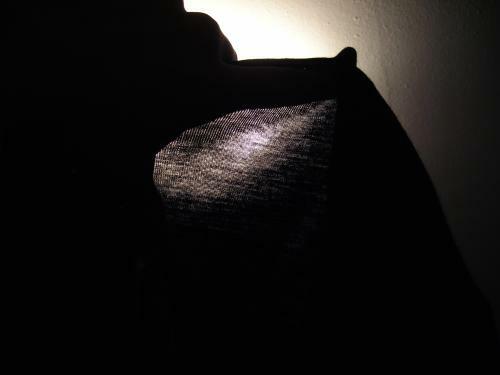 The photo below is of my ceiling light shining through the taut fabric of the Skin200 top. The Bodyfit 260 Tech Top is also a 100% merino wool top within the Skin Layer line, but it is a heavier weight fabric than the Skin200. It has some nice additional features as well. The zip-up collar is configurable to three different positions, and there are also thumb loops so as to extend the arms over the palms of the hand. This top fits looser than the Skin200 top, even though it is also a size small. Like the Skin200, the arms and torso are a bit long, which is a design I like. It is still a fitted shape and there isn't room for much underneath it, but I could easily fit another silk weight or lightweight top as a base layer beneath it. I will test it in both configurations - next to skin and layered over a base layer. The Skin200 top contains two Icebreaker labels - on the cuff of the left arm there is a 'Skin200' tag, and on the right side there is an Icebreaker tag sticking out. On the Bodyfit260, the same Icebreaker tag sticks out of the right side panel, and there is also an Icebreaker logo stitched over the left breast. It is of the same color as the shirt however, so it is barely noticeable. I do not mind labels on the gear I use since they can show a sense of pride and confidence by the manufacturer, but I do not like it when it is too big, bright and flashy. The Icebreaker labels are fine for my tastes. Both tops have very simple, average machine washing instructions. Other than a separate wash the first time, these tops can be tossed in with all of my other clothes. They shouldn't be put in the dryer, however. In all of the Icebreaker documentation (tags, packaging, and website), there are two features that they seem to emphasize the most. The first is that their tops will not stink, even after two weeks of heavy use, and the other is that the Icebreaker merino wool is fantastically soft. So, in addition to my regular test practices of testing fit, durability, comfort, and so-on, I will specifically focus on the feel and the stink of the shirts after a long period of wear. I've already begun to wear the Skin200 top running every day without washing it. When the Field Report is posted, I'll be able to say how it smelled after two weeks! In addition, I'll regularly be wearing these tops as my next to skin layer, both with and without layers, so if there is any chance of them being itchy, I'll notice it! This concludes my Initial Report. Please check back in approximately two months to read about further testing of the Icebreaker tops! Wearing the Icebreaker tops over the past two months has been a very positive experience. I have had them out in a variety of conditions, although due to an unforeseen light winter I have not been able to wear them in temperatures as low as I would have liked. The first trip with the Icebreaker tops was in early February in El Dorado National Forest. I did an easy dayhike on snowshoes where the temperatures were warm and the sun was shining. It was 55 F (12.5 C) when I started off on the hike and climbed over 60 F (15.5 C) as the day progressed. I wore the Skin200 with a fleece vest and was warm and comfortable. The black was sometimes a bit intense with the bright sun and reflective snow, but overall I was very comfortable and when I found myself sweating on short uphill climbs I dried off quickly. At camp that night I decided to keep the Skin200 top on for sleeping, and I also wore it through the next day's light dayhiking. After 36 hours of wear the shirt had no noticeable odor to it. I usually keep a stash of clean clothes in the car to change into if I want fresh clothes for the drive home, but in this case I didn't feel the need to change since the top still seemed fresh. I did not feel uncomfortable wearing it into a restaurant where we stopped for lunch on our drive home. Rather than wash the Skin200 when I got home, I draped it over the back of a chair and saved it for an overnighter the following weekend. The shirt had no obvious smell, so I wanted to see if it would start to smell the next weekend if I did not wash it between uses. The following weekend was a snow camping trip in Lassen National Forest. The first day of the trip was incredibly warm and sunny for a snow trip, with sunny blue skies and the temperature hovering around 60 F (16 C). Overnight a cold front moved through and the second day was overcast and chillier, around 40 F (4 C). On the first day's snowshoe in to camp I again wore the Skin200 top with a fleece vest. I sweat quite a lot on the hike since the sun was very warm and I was moving uphill with a pack on my back. I kept the top on as a base layer for the full two days, and once again it was odorless at the end of the weekend. Further use of the tops has been in the San Francisco Bay Area. I wore the Bodyfit 260 Tech top on an overnight backpack in Point Reyes National Seashore along the Northern California coast. The temperature was approximately 70 F (21C) during the day, dropping to the mid 40s F (7 C) at night. Coastal weather is always difficult to predict - if the fog doesn't blow out it can be cold and damp, but if the fog clears it can be beautiful. I had expected a foggy day so I wore the heavier of the two tops, the Bodyfit 260. I was incredibly warm on the hike into camp, but since it was just a short stroll I didn't bother changing into a lighter top. Once at camp I wore a tank top, but the Bodyfit 260 was a perfect layer to add for warmth as the sun set. The tops were also used on several dayhikes in the Bay Area. The Bodyfit260 top was worn on a dayhike to Montara Mountain, a peak on the coast just south of San Francisco. The day was cold, in the middle 40s to lower 50s F, (7-10 C) and foggy, and the heavier top was perfect when paired with a lightweight fleece. The following week both tops were used on an overnight car camping trip to Big Basin State Park. This was over a nice spring weekend with the sun shining and temperatures in the lower 70s F (21 C). Although they were worn on dayhikes, again I was most impressed by their inability to hold an odor. When I got home all of my gear and clothing smelled like campfire except for the two Icebreaker wool tops. They simply didn't smell like anything - body odor or campfire. I also wore the Skin200 on a long peak bagging hike on the coast just north of Big Sur. I had prepared for typical coastal conditions - cold and foggy - but it ended up being hot and sunny. The Skin200, although lightweight, was far too warm given its black color under the sun. The following weekend I planned a long inland hike and chose not to wear either of the Icebreaker tops since I knew they would be too warm under the sun. Overall I am incredibly pleased with the performance of the Icebreaker tops. The comfort and fit, which go hand-in-hand, are perfect; the material is soft and never itchy, the seams, even on the zippered neck of the Bodyfit260, are unnoticeable, and the tops are fitted to the perfect length so that they do not 'ride-up' behind a pack. They wash very well - I put them in with my regular laundry and pull them out to air dry before throwing the rest of the load in the dryer. They air dry quickly and perfectly back to their original shape. On one occasion I accidentally threw the Bodyfit 260 into the dryer with the rest of the wash. Expecting it to come out shrunken and/or damaged, I was very pleased to see that it came out just fine. It didn't shrink or disfigure. The tops have not stretched or become 'saggy' over time and they still fit as if new every time I put one of them on. 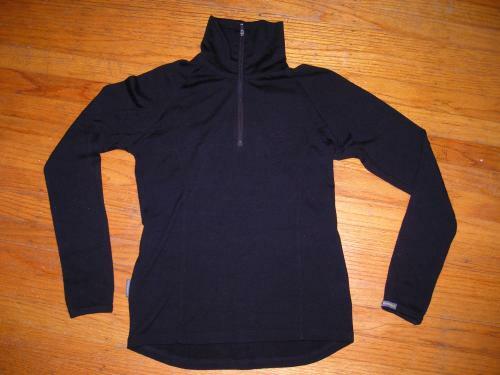 These are the first outdoor sport tops I have used, including other wool tops, that do not retain any kind of body odor. The thumb loops in the Bodyfit260 provide some nice additional warmth when doing things in camp where gloves are difficult to use, such as lighting and fine tuning the flame on a stove. I also discovered another perk of these - when using trekking poles sometimes I get hot spots on my hands where the straps rub. 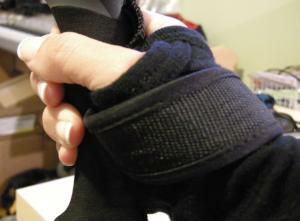 The thumb loops on the Bodyfit260 protect my hands from these straps. In the course of dayhiking and geocaching I went off trail from time to time and managed to catch both tops on bushes and trees. Neither top has a sign of any kind of damage from these off trail adventures. A few weeks ago I found myself accidentally walking through a patch of poison oak. I had nylon hiking pants on along with the Bodyfit260 top. The poison oak touched me from shoulder level down to my feet. My legs have broken out in a very uncomfortable poison oak rash, but there is no sign of it on my upper body. I do not know if the top had anything to do with it, but I do know that I was equally exposed on the top of my body as I was the bottom of my body. With no scientific evidence to back me up, my theory is that the poison oak oils had an easier time permeating the synthetic pant material than the wool top. If I had anything to complain about with the tops, it would be the color. Admittedly, the color choice was mine, and I expected to encounter much colder temperatures this winter than I actually did. The tops, although the perfect weights for many of my hikes during the Field Test Period, were frequently too hot on the trail due to the blazing sun on the black material. If I had a choice again I would choose a lighter color so that the tops would be more useful during all four seasons. This concludes my Field Report. Please check back in two months for my Long Term Report. During the Long Term Test period I have used the tops on a backpack trip along the cool Northern California Lost Coast, while dayhiking and car camping on the hot eastern side of the Sierra Nevada mountains, and while backpacking near snow line in Desolation Wilderness next to Lake Tahoe. Although the Long Term test period has covered the warm late spring and early summer, I found myself using the heavier Bodyfit260 much more frequently than the Skin200. This is because the Skin200, although lighter in weight than the Bodyfit260, is a tight, next-to-skin layer that functions much better as a base layer in cold weather. The Bodyfit260, while heaver, is a looser fitting shirt that allows for a comfortable middle or outer layer on summer mornings and evenings. With the rainy and cloudy winter season over in California, wearing a long sleeve black top for daytime hiking has become unnecessary and dangerously warm. The Skin200, with its close-to-skin fit and comfortable stretch, made a wonderfully comfortable base layer when paired with other layers in the snow and winter cold. However, once the sun came out and temperatures rose, such a layer became uncomfortable and impractical. 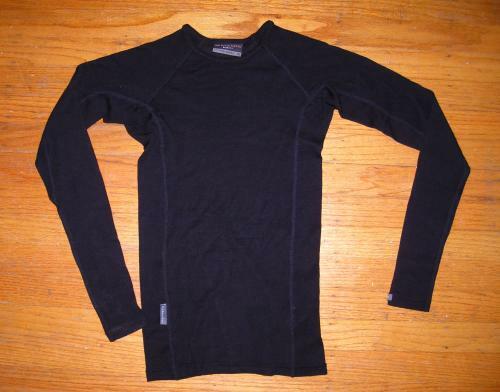 Even though it is a lightweight shirt, the long sleeves and black color made it simply too warm to wear for hiking activities. I cannot wear the Skin200 over anything due to its fit, so it doesn't work as an additional layer over a lighter weight short sleeve base. Had the shirt been a different color, I may have been able to wear it on some of my sunny but cooler hikes - but unfortunately the black made it too warm for even those conditions. I did use it for sleeping and for hanging around camp on cool nights, and I can confirm my observations in my field report - it is wonderfully soft and comfortable next to my skin and I plan on using it extensively once the snow flies again next fall and winter. The Bodyfit260 was used heavily during the Long Term Test period as a middle and outer layer, usually paired with a base layer sport tank top. Compared to several other shirts I own within the same weight range (all synthetic and zip-tops that weigh within an ounce of the Bodyfit260), the Icebreaker top provides much more insulation. It has the best warmth to weight ratio of any shirt in my backpacking arsenal. Since I used it primarily in the morning and evening and under jackets, I can't attribute the extra warmth to the dark color. The Bodyfit260 was my warmth layer of choice for every hike (backpacking and dayhiking) during the Long Term Test period, suffering all the abuses that this entails. It was regularly shoved into a pack, removed from the pack and put on, shoved back in the pack, squished into compression sacks, tied around my waist, sleeves pulled up and down, zipped and unzipped, and soaked with sweat. After each adventure it would be thrown in the laundry with no special care - it would simply be tossed in with all of my other dusty, trail-grimed gear. One feature of the Bodyfit260 that I found to be unexpectedly useful are the thumb loops. I hike with trekking poles, and my trekking poles often get grimy and dirty my hands up quite a bit. I also don't like how the hand straps rub on the inner part of my hand, between the thumb and palm. When I wrap the thumb loops around my hand, they protect this part of my hand from the rubbing and they also keep my hands much cleaner. There is no sign of wear on these thumb loops from the trekking pole straps, which is more than I can say about my hands! These tops have survived remarkably well. The Bodyfit260, which has especially been significantly used and abused over the past couple of months, has done especially well. In addition to the outdoor abuses, I've accidentally sent both through wrong wash cycles and thrown them into the dryer on a high temperature. Looking at the two tops laying before me right now, I would think they had just been pulled off a store rack, they are in such great condition. There is no degradation of quality or material thickness, and they look amazingly fresh and new. I don't know if a lighter color would show more wear, but if they are permanently stained or dirty the black does an excellent job of hiding it. There is no fading to the black color - I've noticed that over time, some black dyes will get a bit grey and faded, but both Icebreaker tops are still as 'vibrant' as black can be. There is no sign of wear from pack straps or belts on either top, even though they were both worn with packs on several occasions. The most important thing about the Icebreaker tops, however, is the comfort. They are exceptionally comfortable and soft. The only other wool I've been able to wear next-to-skin is a designer 100% cashmere wool sweater, and these 100% merino wool Icebreaker tops actually feel softer than the cashmere! Prior to this test, I had been impressed by Icebreaker clothing but had the impression that it was overpriced. I now see that these tops are intended to last a long, long time, and I do not see a need to replace them after a season of use, like I might with some of my lesser quality athletic clothing. I expect these tops to have long life and to be using them for many seasons to come. I want to thank Icebreaker for testing with BackpackGearTest and for making this test a joy to complete thanks to the high quality of the tops.